Semma’s technology director Felicia Pagliuca, with CEO Robert Millman. A new Cambridge biotech will be working on a treatment using stem cells that could let children and adults with Type 1 diabetes do something their bodies currently cannot: produce their own insulin, the hormone that keeps blood sugar levels in balance. Semma Therapeutics is already off to a strong start. On Tuesday, the company will disclose it has raised $44 million from big-name investors, including Boston’s MPM Capital, to commercialize research from the lab of noted Harvard stem cell scientist Douglas Melton. The startup, which is in the process of hiring employees and leasing lab space, is seeking to offer a different treatment approach in a field that hasn’t seen significant change for decades. But it is still likely to be years before Semma’s approach — transplanting insulin-secreting pancreatic “beta cells” into patients — will be available commercially. First, Semma Therapeutics will have to surmount a daunting scientific challenge: overcoming the autoimmune response in Type 1 diabetes patients that causes their bodies to reject and destroy their own pancreatic cells, which naturally make insulin. Felicia Pagliuca, who was a postdoctoral fellow in Melton’s lab in the Harvard Stem Cell Institute from 2011 to 2014, led a team that came up with a way to turn stem cells into cells that can produce insulin. Now, as Semma’s scientific cofounder, she will be working to turn those cells into a business — and a treatment for Type 1 diabetes. Pagliuca, 28, is taking a leave from the MBA program at Harvard Business School to be Semma’s director of technology and corporate development. Semma’s aim is to mass produce pancreatic beta cells and develop a system that will let doctors transplant millions of them into Type 1 diabetes patients, enabling them to generate insulin. “We’re committed to getting there as quickly as possible,” Pagliuca said. Melton’s lab described a detailed process for creating pancreatic replacement cells — starting with stem cells and adding protein-based “signals” that transform them into more specialized beta cells — in a much heralded paper in the journal Cell last October. Pagliuca, the paper’s lead author, said Semma is being formed to take the next steps in preclinical research. As many as 3 million Americans have been diagnosed with Type 1 diabetes, typically discovering when they are still children that their pancreas glands can’t produce insulin. They then have to receive insulin injections multiple times a day for the rest of their lives. Sensing a business opportunity at the juncture of stem cells and diabetes, venture firms MPM Capital, Fidelity Biosciences of Cambridge, and Arch Venture Partners of Chicago are teaming with Minneapolis-based medical technology giant Medtronic plc to back Semma in the company’s first round of financing. MPM’s managing director Robert Millman, who cofounded Semma, will serve as chief executive of the Cambridge startup. Melton is also a cofounder but his role with the startup hasn’t been spelled out. Millman previously founded CoStim Pharmaceuticals, a Cambridge cancer drug startup that was acquired last year by Swiss drug giant Novartis AG. Semma also has struck a collaboration agreement with Novartis AG, which has its global research headquarters in Cambridge, but the startup isn’t disclosing the nature of that partnership. 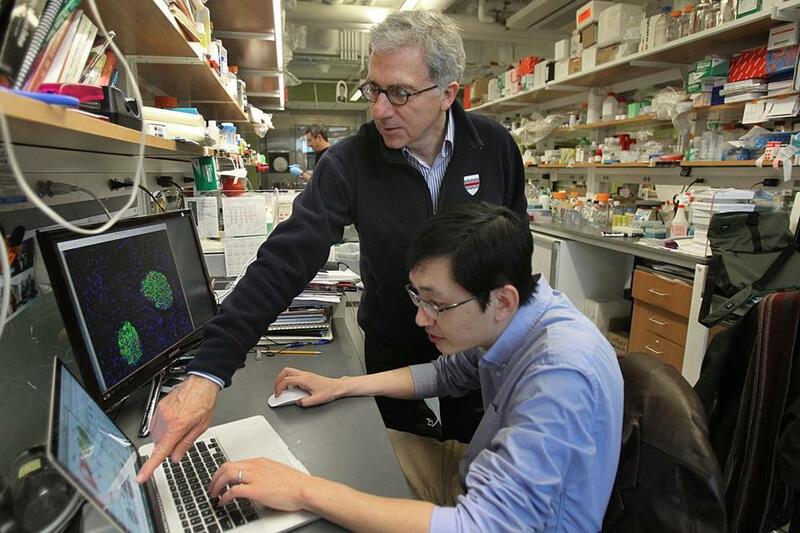 Harvard stem cell scientist Doug Melton (left) and his post-doctoral fellow Peng Yi. Melton’s lab discovered a hormone that in early experiments increases the number of insulin-producing cells in the pancreas. Innovation has been slow in the field of diabetes, where insulin injections have been the standard of care for patients with Type 1 diabetes — previously called juvenile diabetes — since the 1920s. Over the past two decades, there have been improvements in diabetes testing and glucose monitoring, as well as new pumps that can deliver insulin continuously over a period of time. Medical device companies, including Medtronic, have been working to develop an “artificial pancreas” that combines a state-of-the-art pump and monitoring system. Within the field of medicine, however, there is mounting anticipation — along with some sober-minded caution — about the type of cell replacement therapy being pursued by Semma and at least one other company, ViaCyte Inc. of San Diego. Pagliuca, the daughter-in-law of Boston Celtics co-owner Stephen Pagliuca, said Semma will test its cell replacement approach in animals before seeking Food and Drug Administration approval to test the transplant therapy in humans. “If we can transplant our cells in an immune-protected form into these patients, then these cells can serve as true replacements for the cells the patients have lost,” she said.